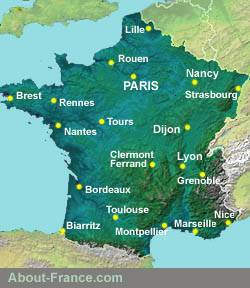 Almost all pages on the About-France.com website are responsive, and can be easily viewed on mobile devices. However for some pages, mobile users will be directed to specific mobile-friendly pages, optimised for viewing on devices with mobile internet access; i-phones, 3G phones, Blackberries and other devices. (Specific mobile pages are slimmed-down or speeded-up versions of standard format pages on the website). Thematic pages - "Best ofs"
The best of France - A guide to "best ofs" by theme. The Regions of France, A-Z by new (2016) regional names, in more detail. Archive article: France, what went wrong?